Keywords: Environmental contamination; contaminant bioavailabihty; root: soil interface. Environmental contamination from improper disposal of hazardous industrial and municipal wastes has long been recognised as an issue of public concern, regulatory activity, and scientific investigation. Such disposals have resulted in the occurrence of in excess of 80,000 potentially contaminated sites in Australia (Natusch, 1997) and over 3 million such sites in the Asia region. In the United States (US), there are estimated to be about 400,000 waste disposal sites where soil and groundwater contamination is deemed to be of sufficient extent and magnitude that some type of remedial action is warranted to protect public health or to minimize adverse environmental and ecological impacts (Rao et al., 1996; USEPA, 2004, http://www.epa.gov/superfund/news/30years.htm). Remediation of contaminated sites to the extent practicable is expected to cost approximately $5 to 8 billion in Australia (Powell, 1992; CMPS&F - Environment Australia, 1997) alone while it may exceed one trillion dollars in USA (Naidu et al., 1996; USEPA, 2004). While the remediation endpoints required by regulators may be similar, the scope of monitoring programs and the assignment of legal/financial liability for remediation efforts may vary greatly from country to country. The public perception of the relative risks of soil and groundwater contamination (in comparison to other hazards) can influence the regulatory policy, and levels of allowed contamination as well as the expectations of the required clean up of contaminated sites. The decision to remediate is often based on the total contaminant loading in soil and ground water. This is still the case in many countries including Australia. However, there is increasing evidence that as contaminants persist in the environment, they become increasingly less available for uptake by organisms, for exerting toxic effects, and for biodegradation and bioremediation by micro-organisms. These changes in the impact of contaminants to ecosystem have been attributed to a decline in the labile fraction of contaminant available for causing such adverse impacts. The fraction of contaminant that is mobile and available for uptake by plants, animals and human is often defined as the bioavailable fraction. The amount of a contaminant in soil that is bioavailable depends on a variety of factors including the properties of both the contaminant and the soil environment (Adriano et al., 2004). Bioavailability defines the relationship between the concentration of a contaminant in soil and the amount of the contaminant that actually enters biological receptors, and thus may cause harm (Reichenberg and Mayer, 2006). Consideration of bioavailability during risk assessment is important given that the mobility and the subsequent availability of a contaminant is inversely related to risk-based cleanup levels. This means that the risk-based cleanup level of a contaminant increases with its decreasing bioavailability. In this chapter, following a brief overview, the various biogeochemical processes controlling the fate and dynamics of contaminants in the soil environment and its implications to contaminant bioavailability is presented. Following input into the soil environment contaminants interact with soil solid phase via a series of sorption-desorption (all ionic and non-ionic solutes), precipitation-dissolution (polar and ionic compounds) reactions including physical migration into subatomic pores and diffusion into solid phase (Figure 1). 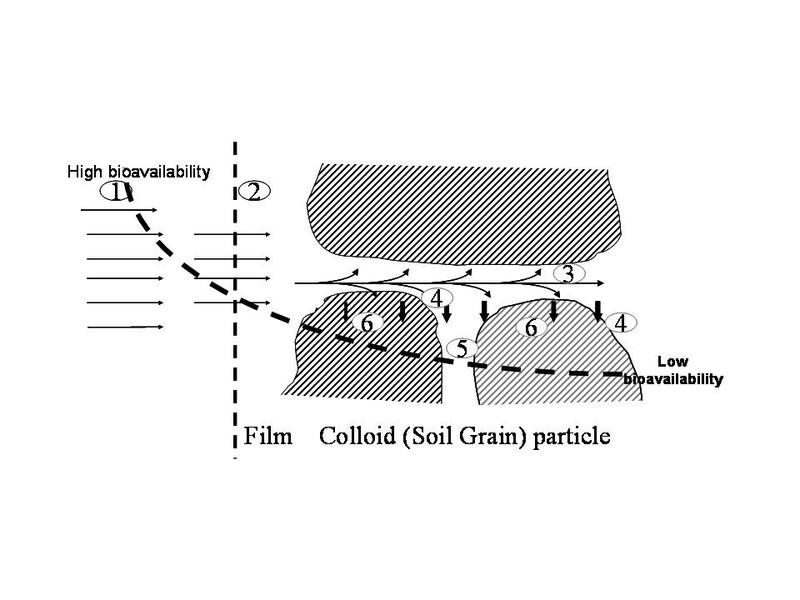 Once the chemical substance is released into soil solution (1) it crosses the solution-solid phase boundary (2) following which it is transported in a liquid filled soil macropores (3). During transport, the chemical substance interacts with colloid surface via either columbic interaction (non-specific sorption) or covalent bonding (specific sorption) (4). This leads to the binding of the chemical to the surface of soil colloids (4). Once bound to the solid surface, the chemical substance redistributes between soil solution and solid mineral and organic phases. This redistribution of the solute as quantified by its distribution constant, Kd is a function of both specific and non-specific sorption (equation 1) with the soil solution concentration being governed by environmental factors (including contaminant loading) all of which influencing the above processes. With ageing, the initially surface sorbed chemicals are slowly redistributed to interior of soil aggregates including the subatomic pores (5, Fischer et al., 1996) with a small proportion diffusing into the solid particles (6, Barrow et al., 1989) from which desorption becomes slow and often difficult and hence contaminants become inaccessible to microorganisms (Karickhoff, 1980). Thus the sorption of a chemical onto soil plays an important role in determining its mobility and bioavailability. Ageing of contaminated soils results in sequestering compounds within the soil particles, resulting in an overall decrease in bioavailability of the sorbed compound (Manilal and Alexander, 1991; Naidu et al., 2003). There is evidence that sequestration of certain organic chemicals with time results in significant decline of their bioavailability. These sequestered organic compounds are known as bound or recalcitrant compounds. For instance, ethylene dibromide, a soil fumigant with relatively high water solubility, volatility, and biodegradeability was reported to persist up to 19 years after its last application (Steinberg et al., 2003). Similarly DDT has been shown to persist in soils for a long period (Boul, 1995). While inorganic chemicals such as heavy metal(loid)s often exist in bound form (unless present in concentrations that saturate the binding sites), organic chemicals exist in soils in both free or bound form; "free" indicates that the compound can be extracted from soil without altering chemical structures while "bound" chemicals are those resistant to extraction. Enzymes and certain minerals can influence oxidation of organic compounds to free radicals, which then results in coupling the contaminant to the organic fraction of soils. For example, enzymes found in soil fungi (e.g. laceases) have been shown to oxidize phenolic compounds and initiate the polymerization process (Hartzinger and Alexander, 1995). This results in the oxidative coupling of the organic contaminant to organic fraction, resulting in the incorporation of these materials (covalently) into humic material (Farenhorst, 2006). Studies have shown that certain pesticides become covalently bound to the humic fraction of soils and the bioavailability of these humic bound fragments were practically negligible (Kelsey and Alexander, 1997). Contaminants present in soil solution (pore water) are the most bioavailable fraction and it is this fraction to which organisms, plants and other species are directly in contact with, thereby having direct access for uptake, and it is this fraction that is mobile, thereby resulting in the leaching through soil to contaminate ground water. Often the soil solution fraction is defined by soil scientists as the "intensity factor'. In long-term contaminated soils, chemicals present in soil solution reach equilibrium with the most labile fraction (i.e chemicals non-specifically bound (exchangeable), equation 2 - 'capacity factor'). As chemicals present in pore water deplete, they are replenished through sequential release from other pools (specific and non-specifically sorbed fraction, see Figure 2) with the rate of replenishment (buffering) being governed by the partition coefficient (kd) controlling the equilibrium between the different chemical binding substrates (Figure 2 and Eq. 2). Metal(loid)s in the solid or sorbed phase are usually unavailable and the uptake by an organism usually occurs when these substances become soluble and reach the solution phase or pore water. Thus, processes influencing the equilibrium between soluble and solid or bound phases for heavy metal(loid)s impact their overall bioavailability. For example, orthophosphate can complex metals such as Pb, Cd, and Zn to form precipitates which are insoluble, relatively stable, and reduce the overall toxicity of the metal contaminants (Bolan et al., 2003). Unless conditions support precipitation, metal(loid)s and ionisable organics generally sorb to charged surface such as layer silicate minerals and organic matter (Naidu et al., 1996). In contrast, the non ionic organic compounds are sorbed generally through partitioning into organic matter (Chiou, 1989). In general, low water solubility of non ionic organic compounds and high organic matter content in soils manifest increased sorption. Given the dependence of bioavailability on plant type, microbial genre, the definitions currently used to define bioavailability may be limiting. Soil and solution factors influencing chemical bioavailability in the soil environment are briefly discussed in the following sections. Soil plays a significant role in controlling the potential bioavailability of contaminants in the environment. The primary soil factors influencing the potential bioavailability of contaminants are soil pH (Figure 3), cation and anion exchange capacities (available charged sites on soil surfaces), texture (clay content), soil type and soil organic matter. 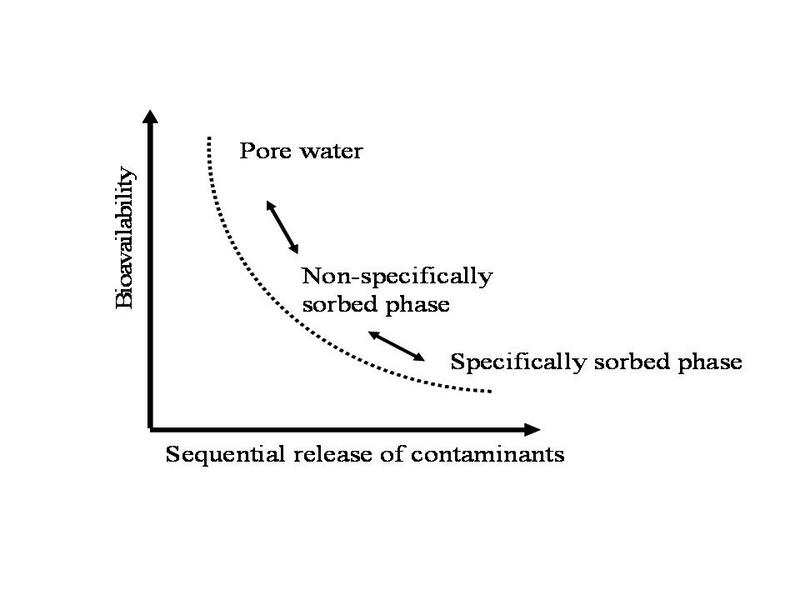 Thus the fate and behavior of contaminants vary significantly with changes in soil type.As shown in figure 4, the ability of metals sorbed to soils varyswith soil type considerably demonstrating that the bioavailability of contaminants is likely to vary with partition coefficient (Figure 5). Contaminant bioavailability is influenced at the root: soil interface given the biochemical changes induced by plants in the rhizosphere. The characteristics of the rhizosphere soil is different from that of the bulk soil because of the soil-root interaction including root exudation and associated microbial activities. Many researchers have studied the role of root exudation for the detoxification of heavy metals and found that root exudates reduce the toxicity of hazardous materials through the formation of organo-metal complexes. However, root exudates may play a significant role in hyperaccumulation. 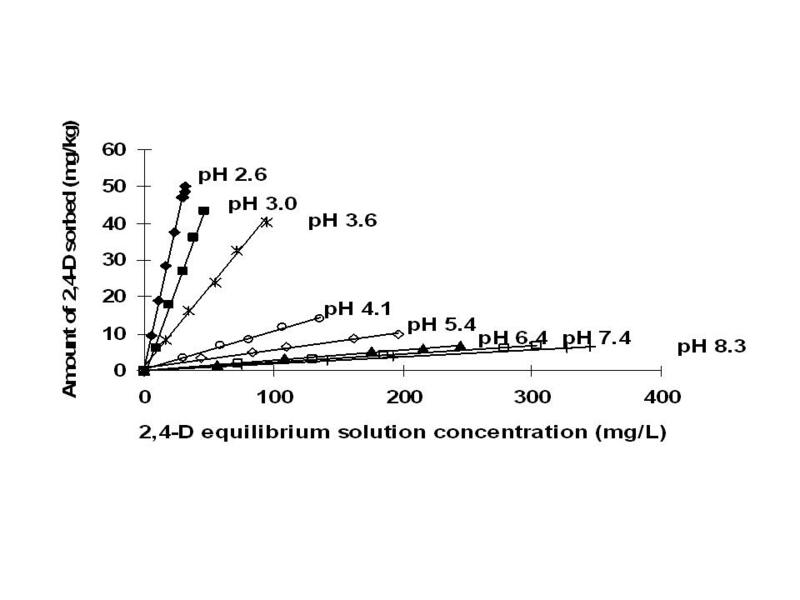 Plants can exhibit specific mechanisms when they are exposed to high concentration of heavy metals resulting in changes of soil pH (Figure 6) and DOC/Organic acids concentrations in the rhizosphere ultimately influencing the contaminant solubility and their uptake by plants. Figure 6. 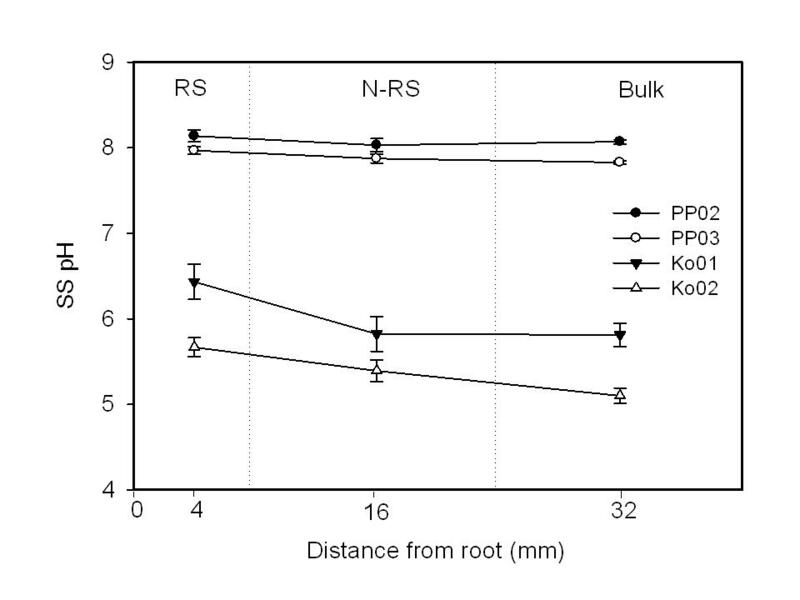 Influence of plant roots on soil solution pH at a distance from root (rhizosphere; RS, near-rhizosphere; N-RS, bulk soil; Bulk) (unpublished). Although bioremediation is considered to be one of the potential remediation options, the lack of contaminant bioavailabihty in long-term contaminated soils makes it difficult to be successful remediation option. As discussed above, as contaminated soils are aged, contaminants gradually disperse and migrate into subatomic pores (Ogram et al., 1985). While diffusion into subatomic pores is spontaneous (though kinetically slow) the reverse process is difficult and requires significant input of energy. For example, several reports suggest the use of surfactants and cosolvents to increase the solubility and consequent bioavailabihty of organic contaminants to enhance bioremediation (Muller et al., 2006). However, the use of surfactants can cause soil damage besides being expensive. Kantachote et al. (2000) recently examined the ability of sodium (Na) to increase DDT transformation as Na is known to cause clay dispersion and increase dissolved organic carbon (DOC) content, thereby increasing the DDT bioavailabihty. This work clearly demonstrated the increased solubility of DDT as shown by an increase in soil solution DDT concentration which is further supported by an increase in bacterial growth in the Na amended long-term DDT contaminated soil. An overview of the transformation and fate of contaminants in soils as controlled by both the properties of the soil and the nature and type of contaminants will be presented in this lecture. Soil properties, including pH, organic matter and clay contents, surface charge, soil solution composition, and contaminant physicochemical properties, including ionic and oxidation state, molecular structure, polarity, aqueous solubility, and lipophilicity, are responsible for controlling the behaviour of contaminants. These properties in turn affect the fraction of contaminants that may be bioavailable in a given soil. This is further impacted by the duration of contact between contaminants and soils with the bioavailabihty declining with ageing. The paper also presents the effect of plant roots on plant rhizosphere and the implications of biochemical changes to contaminant bioavailabihty. N.J. Barrow, J. Gerth and G.W. Briimmer. (1989). J. Soil Sci. 40: 437-50. V.B. Manual and M. Alexander. (1991). Appl. Microbiol. Biotechnol. 35: 401-405. I. Powell. (1992). Contaminated land - who pays? NSW State Pollution Commission Impact Statement Document, NEPC. D.L. Sparks. (1998). Kinetics of soil chemical phenomena: future directions. In. P.M. Huang, D.L. Sparks and S.A. Boyd (Eds. ), Future Prospects for Soil Chemistry. SSSA Spec. Publ. 55, Soil Science Society of America, Madison, WI, pp. 81-101 [ Links ]. USEPA, (2004), http://www.epa.gov/superfund/news/30years.htment of Organic Chemicals in Soil. Soil Science Society of America, Madison, WI, pp. 1-29.